Pokémon Go might have jumped onboard the augmented reality excitement bandwagon at launch but it turns out it's not really that immersive - until now. A German company called Gestion has used Pokémon Go to show off just how real augmented reality can make the game feel. Rather than simply overlaying a Pokémon animation on the real world captured by the phone's camera, this pulls you into the experience. By using a Google Cardboard VR headset loaded with a Samsung Galaxy S7 plus a pmd picoflex 3D depth sensor the wearer is able to look around as if really in the virtual world with a Pokémon right next to them. But that's just the normal game played through an AR headset right? This is where the depth sensor takes it to the next level. 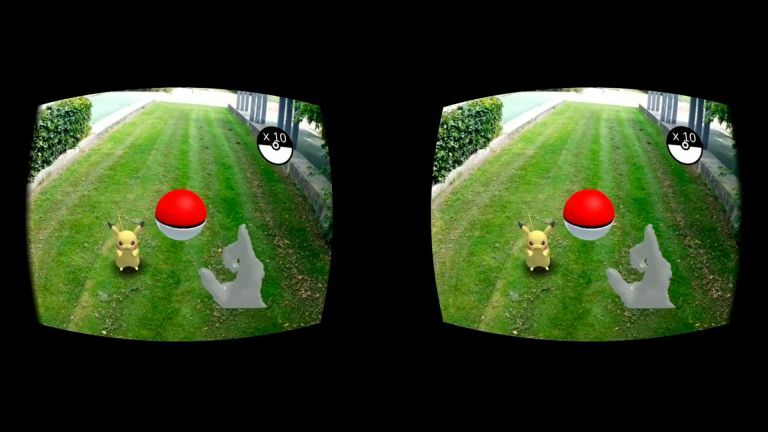 This is able to detect the gamer's hand so the user can move in the real world to make the virtual Pokéball fly towards its intended target Pokémon. This all means a gamer can use real world movements to catch virtual Pokémon in an augmented reality by using their hands - controller free. Complicated? It just sounds it. But it's also not available. This tech was used as a demo by Gestion to show off what it can do. The company is not working with Pokémon Go creator Niantic Labs. Here's hoping those guys see what's been done and start integrating it into the real game soon. Seeing people wandering the streets in AR headsets could be a reality sooner than expected.